Crestwood Painting warrants labor and material for a period of two years. If paint failure appears, we will supply labor and materials to correct the condition without cost. This warranty is in lieu of all other warranties, expressed or implied. Our responsibility is limited to correcting the condition as indicated above. This warranty excludes, and in no event will Crestwood Painting be responsible for consequential or incidental damages caused by accident or abuse, normal wear and tear, temperature changes, settlement or moisture; i.e., nail pops or cracks caused by expansion and/or contraction. Cracks will be properly prepared as indicated at time of job, but will not be covered under this warranty. 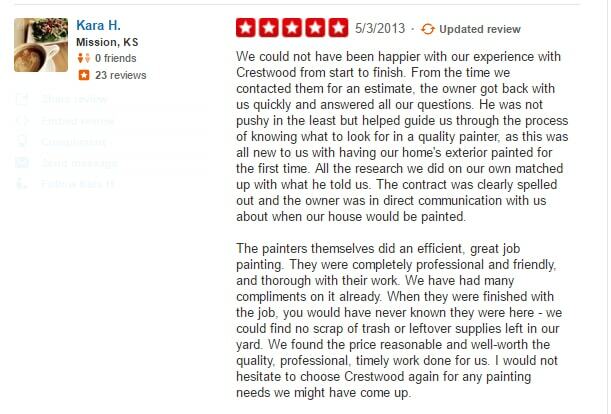 Crestwood Painting is not responsible for differences in paint color or sheen when performing warranty work.